Nicole’s research focuses on the gendered politics of conflict and peacebuilding, violence, security and participation. She has a strong interest in feminist institutional theory, as well as conceptual debates on regulatory pluralism and contested notions of (gendered) order as they are evident in local and global politics. 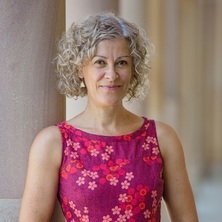 Since the early 2000s, she has conducted research in the Pacific Islands region focusing on gender politics, gendered security and post conflict transition in Fiji, New Caledonia, Bougainville and Solomon Islands. She has worked in collaboration with women’s organisations, women decision-makers and women policy-makers in these settings to progress aspects of this work. She has led large, externally funded, comparative research projects examining how women's rights to security are instsitutionalised in Pacific Island countries (2013-2016) and where and how women particiipate in post-conflict transformation (as part of a broader collabortive ARC Linkage Project (2016-2020). Aside from the scholarly publications listed below, she has made influential contributions to national and regional intergovernmental policy forums on gender, security and development programs and is a regular contributor to national and regional on-line opinion editorial sites. Journal Article: Liberal–local peacebuilding in Solomon Islands and Bougainville: advancing a gender-just peace? Gender Violence, Women's Empowerment and Human Rights in Melanesia: Exploring the French Connection. George, Nicole Situating women: gender politics and circumstance in Fiji. Canberra ACT, Australia: ANU E Press, 2012. George, Nicole (2016). 'Lost in Translation': gender violence, human rights and women's capabilities in Fiji. In Aletta Biersack, Margaret Jolly and Martha Macintyre (Ed. ), Gender violence and human rights: seeking justice in Fiji, Papua New Guinea and Vanuatu (pp. 81-125) Canberra, Australia: ANU Press. George, Nicole and Doerksen, Chantelle (2016). Gender and peacebuilding: hybridity and friction in the Pacific Islands. In Pamina Firchow and Harry Anastasiou (Ed. ), Practical approaches to peacebuilding: putting theory to work (pp. 81-108) Boulder, CO, United States: Lynne Rienner Publishers. George, Nicole (2015). Women in politics: Pacific Islands and New Zealand. In Women, policy and political leadership: regional perspectives in today's world (pp. 79-86) Singapore, Singapore: Konrad-Adenauer Stiftung. George, Nicole (2014). Gender in the Pacific Islands. In Charles Hawkesly and Nichole Georgiou (Ed. ), The Globalization of World Politics: Case Studies from Australia, New Zealand and the Asia Pacific 3rd ed. (pp. 59-62) South Melbourne, VIC, Australia: Oxford University Press. George, Nicole (2014). In sickness and in health: evolving trends in gay rights advocacy in Fiji. In Niko Besnier and Kalissa Alexeyeff (Ed. ), Gender on the edge: transgender, gay and other Pacific Islanders (pp. 293-322) Honolulu, United States: University of Hawaiʻi Press. George, Nicole (2013). Beyond cultural constraint: gender, security and participation in the Pacific Islands. In Sara E. Davies, Zim Nworka, Eli Stamnes and Sarah Teitt (Ed. ), Responsibility to Protect and Women, Peace and Security: Aligning the Protection Agendas (pp. 155-180) Leiden, Holland: Martinus Nijhof Publishers. George, Nicole (2009). Shifting Terrains of Transnational Engagement: Women's Organizing in Fiji. In D'Costa, Bina and Lee-Koo, Katrina (Ed. ), Gender and Global Politics in the Asia-Pacific (pp. 175-193) United States: Palgrave Macmillan. George, Nicole (2006). Coup spells more trouble for long suffering Fijians. In Barbara Nelson and Robin Jeffrey (Ed. ), Capturing the year 2007: Writings from the ANU College of Asia and the Pacific (pp. 180-183) Canberra, ACT, Australia: ANU College of Asia and the Pacific. George, Nicole (2002). French monopoly of the linguistic marketplace. In Anthony J. Liddicoat and Karis Muller (Ed. ), Perspectives on Europe: Language Issues and Lanaguage Planning in Europe (pp. 61-79) Melbourne: Language Australia. Liberal–local peacebuilding in Solomon Islands and Bougainville: advancing a gender-just peace? Sexual violence and hybrid peacebuilding: how does silence speak? Institutionalising women, peace and security in the Pacific Islands: Gendering the ‘architecture of entitlements’? George, Nicole (2013) 'It was a town of friendship and mud': 'flood talk', community and resilience. Australian Journal of Communication, 40 1: 41-56. Jacqueline Leckie (ed. ), "Development in an Insecure and Gendered World: The Relevance of the Millennium Goals"
George, Nicole (2011) Pacific women building peace: A regional perspective. The Contemporary Pacific, 23 1: 37-72. George, Nicole (2010) "Just like your mother?" The politics of feminism and maternity in the Pacific Islands. The Australian Feminist Law Journal, 32 77-96. George, Nicole (2008) Contending masculinities and the limits of tolerance: Sexual minorities in Fiji. Contemporary Pacific, 20 1: 163-189. Women's re-visions of globalisation:'Level playing field' or 'Uphill battle'? Pakistani Muslim Women's Property Rights: A Choice between Material Empowerment and Familial Security?